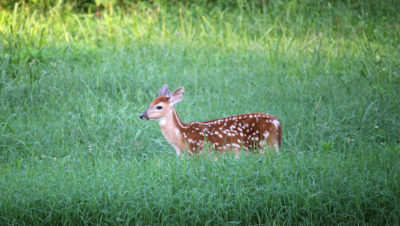 Fawns, born from April through July, are purposely left alone by their mothers. Female deer, called does, stay away from the fawns to avoid leading predators such as dogs or coyotes to their location. The white-spotted coat camouflages a fawn as it lies motionless in vegetation. Young fawns are “hiders” and will not try to run away when they are approached. Does will return several times each day to move and/or feed their young. You probably will not see the doe at all since she only stays to feed the fawn for just a few minutes before leaving it alone again. If less than 24 hours have passed since a fawn has been “rescued,” the fawn should be taken back and released at the exact same location where it was found. Raising a wild animal in captivity is illegal unless you have a VDGIF wildlife rehabilitation permit. Each animal’s nutritional, housing, and handling requirements are very specific and must be met if they have any chance of survival. With even the best professional care possible, the survival rate of rehabilitated fawns and many other animals is very low. More than 50% of fawns brought to rehabilitation facilities die before being released due to injuries they come in with and unavoidable physical stress during the rehabilitation process. Of those fawns that are released, a very small percentage survives the first year in the wild. The best advice for someone who wants to help wildlife is to keep it wild. Once people interfere, we reduce the opportunity for animals to receive natural care and we increase the risk of harming our wildlife heritage.